Improved User Experience -- Many changes were made to assist the overall user experience, including additional and streamlined tips, attachable popups, removal of hard to use drop-down menus, and general transition to graphical representations instead of text readouts. Major Performance Improvements -- The overall memory usage of kAuction has been reduced by approximately 70%, and most users will find kAuction's stable memory usage at 1 - 1.2 megs. Wishlist Database Removed -- An incredible memory hog and feature that was not very widely used in practice, as it could not compete with more immediate solutions found online, the Wishlist Database/Search features have been removed. Manual Wishlist additions still exist and should remain fairly bug-free for this release. New Bid Popout Menu -- A major downfall of kAuction in the past has been the lack of incentive for a user to indicate their current item when bidding on an auction. A new Bid Popout menu has been added to greatly encourage users to indicate the proper currently equipped item in a user-friendly interface. Further optimize client/server communication -- There are still known instances where User actions (entering a Bid, Voting on an Auction, etc.) will appear to have no affect immediately, and while performance should be improved over the previous version, it is still far from flawless. Best bet: Treat actions like bidding or voting as if they were an online credit card confirmation, and only click once and wait patiently. The UI should update momentarily to reflect the change. Disenchantment Icon showing for auction with assigned winner -- In rare cases, the UI will display the Disenchant icon where an actual winner is announced, which can be confusing. Enchanter(s) in the raid should check the auction (by clicking to view any bids or in the chat output) to verify if a winner was announced for that auction. If all else fails, hang onto potential DE items until the end of the raid before actually disenchanting. Current Item Popout Config unimplemented -- The next major update should include configuration options for the popout, including filtering of items, item-types, and item level ranges displayed in the popout menu. Any questions are welcome as always and I'll be sure to talk to people online and during the raid to explain to everyone in a bit of a walkthrough how to navigate/use this newer version. Last edited by Kulldam; 05-01-2011 at 05:38 PM. Updated to 2.0.156, fixed a number of issues and should perform properly in raid situations now; download link above. Note: With this (and any subsequent updates), you do not need to fully delete your kAuction folder or SavedVariable data; only the initial change from the old kAuction to the new version required that, but these minor changes can simply be installed by overwriting the old kAuction addon folder. Last edited by Kulldam; 12-22-2010 at 12:48 AM. kAuction hosting moved back to Curseforge. This 2.1 update adds Dungeon Journal Wishlist Integration, which is amazing (ok not really) but I'm pleased with it as a little feature that allows users to quickly and easily add items to their kAuction Wishlists directly through the new Dungeon Journal Loot List interface. 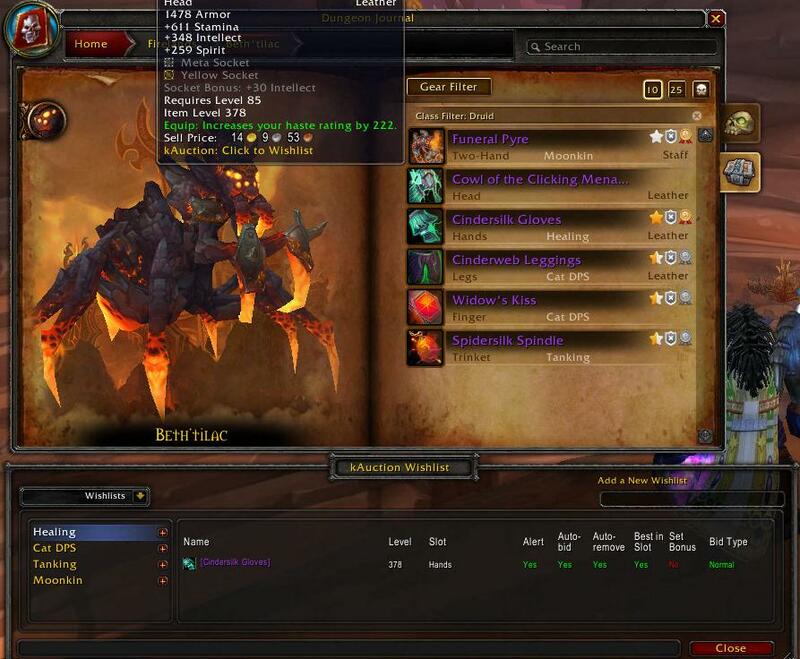 Since Blizzard now provides full loot lists in-game, no longer do addons such as kAuction need to try to scan all possible item IDs and other weird mumbo-jumbo to actually detect items that are available through the player's local cache. Instead, the Dungeon Journal surveys all available loot as needed, and thus Blizzard has provided a great way to integrate those item lists into the Wishlist feature. 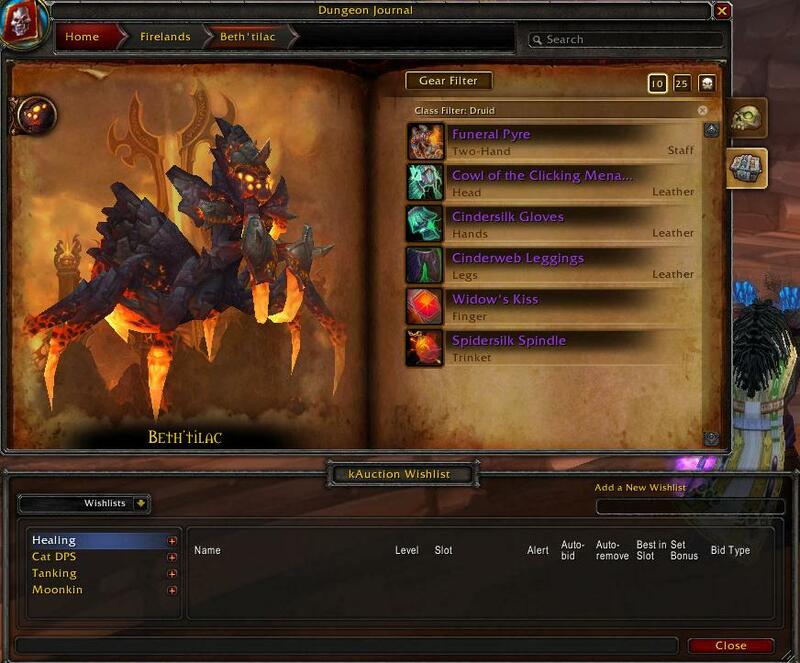 This is the Dungeon Journal loot list with some empty Wishlists created in kAuction at the bottom. Left-clicking any item in the Dungeon Journal list will add it to the first Wishlist found (in this example, "Healing"). Further left-clicks will cycle the assigned wishlist through the rest of your wishlists. 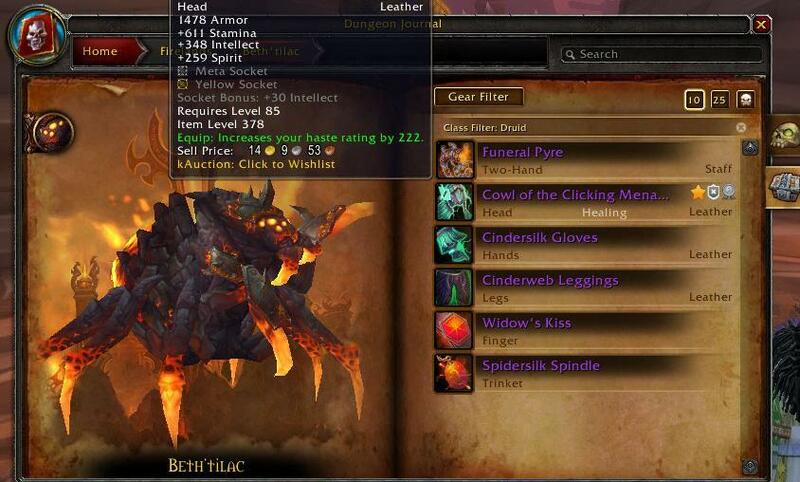 In only a few seconds of clicking, I have quickly added all Druid-filtered items that drop from Beth'tilac to my relevant wishlists, and the proper settings can be verified in the kAuction Wishlist window below. In addition to the clear label at the bottom center indicating the active Wishlist an item is assigned, if any, there are a handful of useful buttons at the top right for any Wishlisted item to set commonly used flags for kAuction without opening the kAuction Wishlist window. Tooltips on mouse-over explain exactly the current setting and how to change, but the Star allows the user to set the Bid Type of the item (full-star for Normal bid, half-star for Offspec bid, and empty-star for Rot bid); left-clicking cycles through these flags. Setting if the item completes a Set Bonus can be done with the Shield button toggle, as can the Best in Slot flag via the Ribbon toggle. Changing these settings here immediately updates the kAuction Wishlist and vice versa, so users can utilize the most convenient method. Simply right-click on any Dungeon Journal item that is assigned to a Wishlist to remove it from that list (or left-click to cycle through all lists until no Wishlist is displayed, which also indicates deletion). Even in large lists of non-wishlisted items, it is easy to quickly spot items that are wishlisted and make settings, add new ones, or delete them outright. Last edited by Kulldam; 06-26-2011 at 12:30 PM. Added: WeakAuras Custom Event configurations. 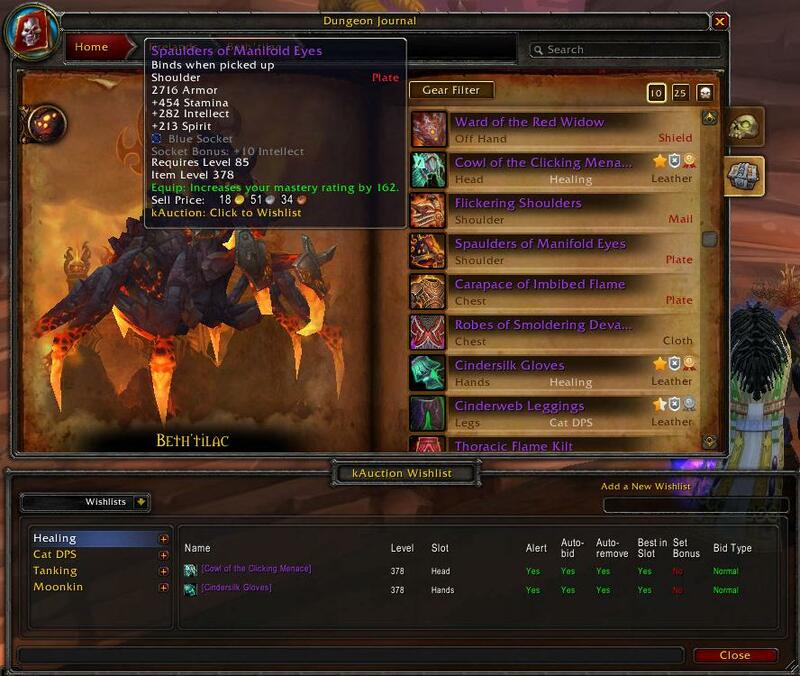 Purpose: By modifying the Custom Event Timer code in addition to this kAuction update, now the more complex WeakAuras configuration settings can be modified outside of WeakAuras through the kAuction interface. A screenshot of the basic interface can be found below. 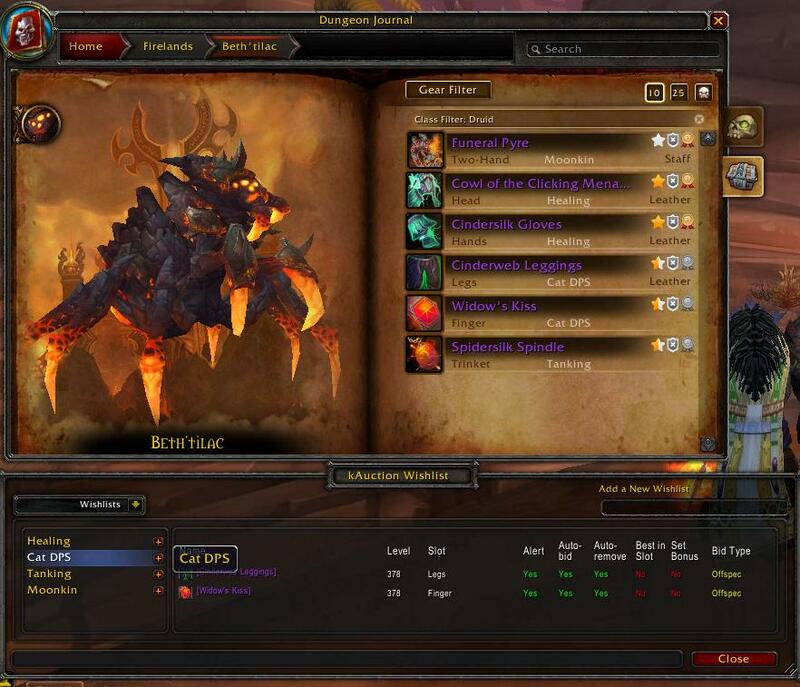 The main advantage is that now once a user imports a Custom Event Timer into WeakAuras the first time, the underlying configuration settings that dictate how the Custom Event behaves can be modified by one person and automatically updated to all individuals in the raid by broadcasting the appropriate Config. The Configurations within kAuction utilize a unique identifier as their name ("newid" is the currently edited ID in the screenshot) and this ID should match the ID specified in the WeakAuras Custom Event Timer settings. This will allow much more streamlined raiding for situations such as H:Baleroc where rotational information is vital but is a pain to manually update. To prevent unnecessary corruption or tampering, if a Configuration is received with an ID that already exists for the recipient, a confirmation box requires player input to allow the settings to be overwritten. Lastly, it's worth mentioning that the Custom Event Timer code will try to find valid kAuction Configuration data for the particular display first and foremost, but if no custom kAuction Configuration is found, the normal config settings within the CE Config > Actions are then utilized. FIXED: Issue with Encounter Journal frames. Note: Encounter Journal wishlist modifications now utilize Right-Click rather than left click for adding to a wishlist, or toggling assigned wishlist. Additionally, Alt+Right-Click is now used to remove an item from wishlists. FIXED: Encounter Journal compatibility post 5.0.4 patch.